Spacers are small rubber elastics bands that are wedged between two adjacent teeth create enough space for an appliance to easily fit around a tooth. When are spacers put in ? Usually 5-10 days prior to inserting an appliance in the mouth. For some, the process of fitting separators for bands is completely painless but it is not uncommon to feel discomfort, especially soreness in the jaw. Initially, it will feel as though there is a large piece of meat stuck between your teeth. This can cause a sense of pressure between the teeth and sometimes against the gums which can vary from a minor annoyance to a toothache-like sensation. If you have tightly-set molars, you may experience increased discomfort because the separators have more work to do in creating a sufficient gap between these cramped teeth. The discomfort should diminish as the days go by. How Can Discomfort be Managed? The pain or discomfort caused by spacers may be managed by using a combination of pain medication and dietary changes. the pain can most often be managed using over the counter analgesic medication. Chewing tough or hard foods can also increase your discomfort. Opting for soft foods can help to minimize irritation caused by chewing. Is Special Care Required when Wearing Spacers? It is recommended that you avoid sticky foods like chewing gum, caramel, and gummy candy. These foods can stick to the spacer and pull them out of place.If the spacers should fall out they can be flossed back into place. If you do not feel comfortable doing it yourself please call our office at (289) 588 -8747. 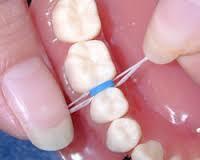 Failing to do so will result in an uncomfortable experience when the orthodontic band and braces are fitted. Continue to brush your teeth as you normally do, but avoid flossing between teeth as this could dislodge the separators.